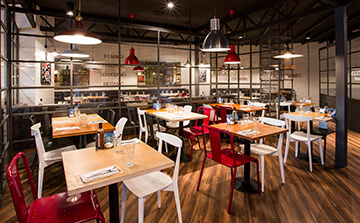 Ginos is transforming through a comprehensive overhaul with a trendier, more modern and dynamic look thanks to the country-industrial decor. It’s a place to enjoy the best offering in a modern and dynamic space without letting go of the cozy warm spirit it has always been known for. One new development is the incorporation of a spectacular open oven and a kitchen that offers an excellent quality/price ratio where 100% artisan cooking and the use of the highest quality ingredients with D.O. Italy are the priorities. 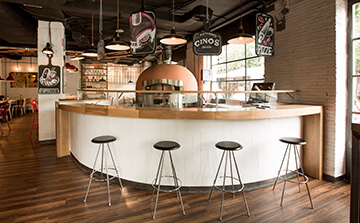 Carefully thought out to the very last detail, the all-new Ginos design is inspired by the Italian kitchen as a gathering place; the place where everything is cooking from food to the most intimate and fun conversations among friends, couples or families. The atmosphere and decoration were developed by ILMIODESIGN, a design studio with Italian roots. They have worked to create a cozy and comfortable restaurant that has nothing to do with the typical traditional Italian trattoria design. In line with the latest trends in country-urban decoration, noble materials were used to build this restaurant such as untreated natural wood which gives rise to rough surfaces without polishing or shining and very comfortable furniture including Chester sofas. Industrial style details were also used such as the sheet metal, metal and industrial lamps to add a more modern touch yet avoiding any excess to prevent a cold feeling. This new concept has created a more versatile restaurant with several atmospheres depending on the eating time. Customers can have a snack or a supper at the bar and the high tables at the entrance for a more informal, casual gathering or they can sit in the dining room to try Ginos’ offering more peacefully. The lighting also plays an essential role in the creation of two different atmospheres, with more boisterous and clear lighting during the day and dimmer, more intimate lighting at night. Besides emphasizing the design of the new restaurant, special attention has also been placed on updating the menu. In order to transmit an authentic Italian gastronomic experience and adapt to its customers’ preferences, the restaurant has created new ways to present and try its dishes.